James Cameron conceived the terminator robot as an infiltration unit that could blend seamlessly into crowds. (His first choice for the role was Lance Henriksen.) 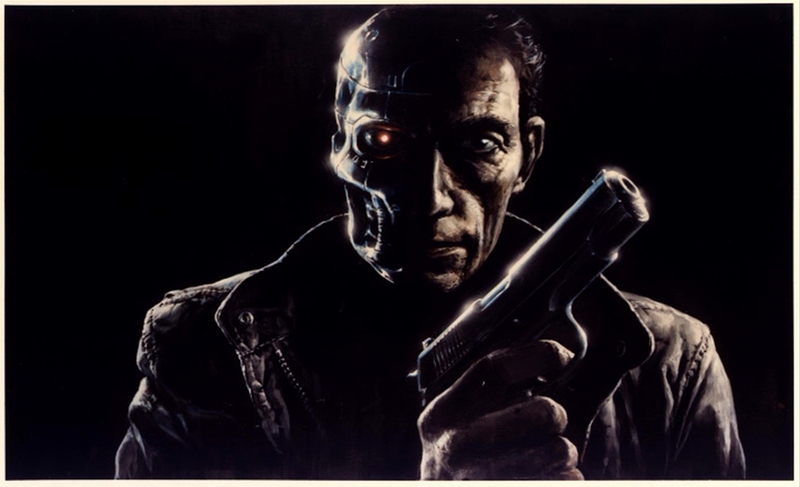 He met Arnold Schwarzenegger as a possible choice to play the film’s human hero, Kyle Reese, but Schwarzenegger was more interested in playing the villain, and Cameron immediately sensed that while this 250-pound Austrian wouldn’t blend into any crowd outside of a bodybuilding competition, he would instantly make the character a credible threat. Thus, The Terminator was born. But that’s the reason for Cameron’s decision off-camera. What’s the in-world explanation why all the Terminators, from the first film right on through Terminator Genisys, look like the former Governor of California? The closest the movies have come to a reason is in this deleted scene from Terminator 3: Rise of the Machines. Yeah, you got to ask yourself, ‘Why did they make these characters look and sound like Arnold? There has to be a reason. So yeah, it has flashed through my mind that there has to have been a prototype. There has to have been a guy who’s DNA was harvested from - that they grew the organic outter layer that they grew the Terminator from...and that presumably was a real person at some point. Now, the question is, did that person have some sort of meaning to Skynet on WHY they chose that one (Arnold)? ... I’ve asked myself these questions but it’s never been resolved ... so stay tuned! I know some folks feel burned out on The Terminator and think the series needs a break, if not permanent retirement. I’m maybe not the most objective observer of these issues, but I don’t agree. And if James Cameron is going to be involved in the story, I really want to see what he comes up with. T2 3D is in theaters on August 25.